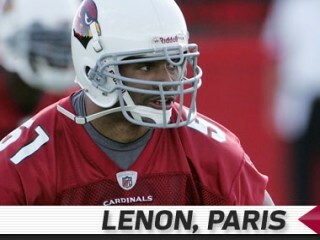 Paris Lenon is an American football linebacker for the Arizona Cardinals of the National Football League. Entered the NFL when he was signed by the Carolina Panthers as a rookie free agent on 4/26/00 before being waived on 6/9/00 and spending the remainder of the season out of football. Signed by the Packers as a free agent on 4/26/01 before being waived on 7/24/01. Signed with the Seahawks on 8/16/01 before being released on 8/27/01. Signed to the Packers practice squad on 12/27/01 where he spent the remainder of the season. Played for the Memphis Maniax of the XFL during the team’s 2001 campaign. Allocated to NFL Europe by the Packers on 2/8/02 where he started all 10 games for the Amsterdam Admirals before returning to the Packers and appearing in 64 games (16 starts) over four seasons. Signed with the Detroit Lions on 3/22/06 as an unrestricted free agent and spent three seasons in Detroit, starting all 48 games. Signed with the Patriots as an unrestricted free agent on 5/27/09 before being released by New England following training camp on 9/5/09 and signing with the Rams on 9/16/09. Signed a three-year contract with the Cardinals on 3/15/10 as an unrestricted free agent. 2009: Appeared in 15 games with 10 starts for the Rams … finished second on the team among LBs with 44 tackles and tied for team lead with three forced fumbles … appeared in his third game with the Rams and earned his first start of the season @ SF (10/4), totaling three tackles and one pass defensed … registered a season-high seven tackles @ Jax (10/18) … in his fifth start of the season, recorded three tackles and his first forced fumble vs. Sea (11/29) … recorded his second forced fumble in as many games in the start @ Chi (12/6) … recorded three tackles, a pass defensed and his third forced fumble in four games vs. Hou (12/20). 2008: For the third consecutive season, started all 16 games at MLB for the Lions, totaling 146 tackles, 1.5 sacks, two forced fumbles and tying a career-high with two fumble recoveries … recorded 10 tackles (nine solo) @ SF (9/21) ... posted a then season high 11 tackles (five solo) the following week vs. Chi (10/5) … notched his first sack of the season when he took down Vikings QB Gus Frerotte @ Min (10/12) … recorded nine tackles and his first fumble recovery since the ’06 season finale at Dallas in the start vs. Was (10/26) … tallied seven tackles, his second fumble recovery of the season and one pass defensed @ Car (11/16) … recorded a team-high 12 tackles vs. Ten (11/27) … led the team with 13 tackles, established a career-high with two forced fumbles and added a half-sack vs. Min (12/7) … established a career-high with 17 tackles, including a career-high 10 solo tackles @ Ind (12/14); marked his fifth game with 10+ tackles in ’08. 2007: For the second consecutive season, started all 16 games for Detroit and finished second on the team with a career-high 161 tackles (101 solos) … 161 tackles marked the seventh-highest total in Lions history … had eight games with at least 10 tackles … recorded six tackles and sacked Eagles QB Kevin Kolb forcing a fumble recovered by Detroit @ Phi (9/23) … totaled 12 tackles and recorded his second sack in as many games when he took down Brian Griese in the fourth quarter vs. Chi (9/30); sack came on a third down play with the Lions clinging to a 24-20 lead and resulted in a punt and the Lions taking a 31-20 lead with a TD on the ensuing drive … tied a then career-high with 14 tackles (eight solos) vs. TB (10/21) … the following week, returned with a team-high 14 tackles (10 solo) @ Chi (10/28), giving him 28 tackles over a two-game span … recorded nine tackles and forced a Brandon Jacobs fumble in the third quarter vs. NYG (11/18) … recorded seven tackles and intercepted Chiefs QB Brodie Croyle in the second quarter, returning it 61 yards for his first career TD: score gave the Lions a 19-0 lead in a game they went on to win 25-20. 2006: Started all 16 games for the first time in his career, splitting time at strongside and middle LB for the Lions … finished second on the team with 97 tackles (60 solos) and added an INT, three passes defensed, two fumble recoveries and four special teams tackles … in his first game and start for the Lions, recorded four tackles vs. Sea (9/10) … recovered his first fumble of the season in the second quarter vs. GB (9/24) … hauled in his first career INT when he stepped in front of a Brett Favre pass in the third quarter @ GB (12/17) … tied his season-high with nine tackles and recovered a Tony Romo fumble in the third quarter @ Dal (12/31) in the season finale. 2005: For the fourth consecutive season, appeared in all 16 games for the Packers, with 12 starts at OLB … member of a defensive unit that ranked seventh in the NFL in total defense … tallied 79 tackles (47 solos), including 1.5 sacks and added five passes defensed and one forced fumble … combined with DT Grady Jackson to drop Vikings QB Daunte Culpepper for his first career sack @ Min (10/23) … recorded his first career solo sack and first career forced fumble on the same play, taking down Bengals QB Carson Palmer in the first quarter @ Cin (10/30) … posted a season-high eight tackles (seven solos) with one pass defensed vs. Chi (12/25). 2004: Appeared in all 16 games with four starts for Green Bay during the regular season and also appeared in the Wild Card contest … made his first career start in the season opener @ Car (9/13) and suffered a broken thumb in the game … appeared in the next four games (one start) despite wearing a cast … started and made a then career-high 12 tackles and recorded his first career pass defensed vs. Det (12/12) … appeared in the Wild Card matchup vs. Min (1/9/05) but did not record any statistics. 2003: Battled through numerous injuries to appear in all 16 regular season games for the second straight year, while also appearing in both postseason games for the Packers … finished second on the team with 16 special teams tackles, adding two special teams tackles in the postseason … saw action at LB and recorded two tackles vs. Sea (10/5) … recorded two special teams tackles and one tackle on defense @ STL (10/19) … saw most extensive action at LB and recorded a season-high four tackles in the season finale vs. Den (12/28) … recorded two special teams tackles in the Wild Card matchup vs. Sea (1/4/04) … saw action but did not record any statistics in the Divisional matchup @ Phi (1/11/04). 2002: Appeared in all 16 games and one postseason contest for the Packers, leading the team with 22 special teams tackles during the regular season, the highest total by a Green Bay player in 12 years and the fourth-highest total in franchise history … in his third NFL game, established a career-high with four special teams tackles @ Det (9/22) … the following week, recorded his first tackle on defense and added two special teams tackles vs. Car (9/29) … appeared in the Wild Card matchup vs. Atl (1/4/03) but did not record any statistics … prior to the regular season was allocated to NFL Europe by the Packers, where he started all 10 games for the Amsterdam Admirals and led the team with 50 tackles, while also totaling two INTs and five passes defensed. 2001: Signed to the Packers practice squad on 12/27 where he spent the remainder of the season and postseason … played the 2001 XFL season with the Memphis Maniax and saw action in four games, collecting 14 tackles. A three-year starter and four-year letterman at the University of Richmond, appeared in 45 games with 24 starts during his collegiate career … totaled 320 tackles, including 12.0 sacks, plus four forced fumbles, two fumble recoveries, 10 passes defensed and one INT for the Spiders … named All-Atlantic 10 Conference in both 1998 (first-team) and 1999 (second-team) … finished second on the team in tackles in his sophomore (1997) and junior (1998) seasons … returned a blocked FG 80 yards for a TD against Northeastern during his sophomore season … played primarily on special teams as a freshman in 1996 … redshirted during his first season at Richmond in ’95.